One of the best things about our hobby is going to contests to share the models we build and to see other modelers' work. The one contest I always attend every year living here in the Northeast is Mosquitocon, sponsored by IPMS New Jersey. It's always a good show with a lot of models in the contest and a good mix of vendors, both professional and individual modelers selling from their personal stash of kits. This year's show was as strong as any other, and for me it informally kicks off spring and the contest season in this part of the country. Those of you who've been reading Scale Model Soup for a while know that I'm an advocate of entering contests, and generally being a man of integrity I entered my two latest builds, an Airfix 1/72 P-51D Mustang and an Academy 1/72 F4F Wildcat (which will be the subject of a separate article in the coming weeks). There were some outstanding models on the tables, so I thought I'd share a few that caught my attention. One of the best examples of painting and finishing skills was this SBD. Looks like 1/48 scale, right? Nope, it's 1/350 scale! The finish was as good as any model in the contest four or five times its size. It even had tiny zinc chromate paint chips that you can just make out in my photos. Unfortunately I forgot to take my reading glasses with me, so I was unable to fully appreciate the subtle application of paint on the model, but it was among the best things I saw all day. Another fine example of painting skill, exemplified on this 1/72 Tamiya Fw-190 D-9. Masterful use of an Iwata airbrush. Here's Airfix's new-tool 1/72 Tigermoth, the first I've seen in person, built up. The modeler reported that it was mostly out-of-the-box, with only the cockpit doors being cut out and displayed folded down. Really nice little kit that makes me excited about building mine. I've always like the fugliness of the Aviation Traders ATL-98 Carvair, and this Roden 1/144 kit showed off the awkward profile of the airplane perfectly. I've written about my fascination with seaplanes here before, so it's always a pleasure to see one as well built, finished, and displayed as this Azur 1/48 Loire 130M. There were two 1/48 Whirlwinds on the table,each as well built and painted as the other. One was the Classic Airframe offering and the other the new Trumpeter kit. This is the former, which I think shows better detail overall and will be my preference if/when I buy a Whirlwind. You don't often see a NMF Bf-109, but this one -- an Eduard 1/48 G-6 -- was among the best in its category and among all the 1/48 scale entries. Beautiful Monogram 1/48 F-101B. The mirror base really showed off the tones the modeler used on the engines. 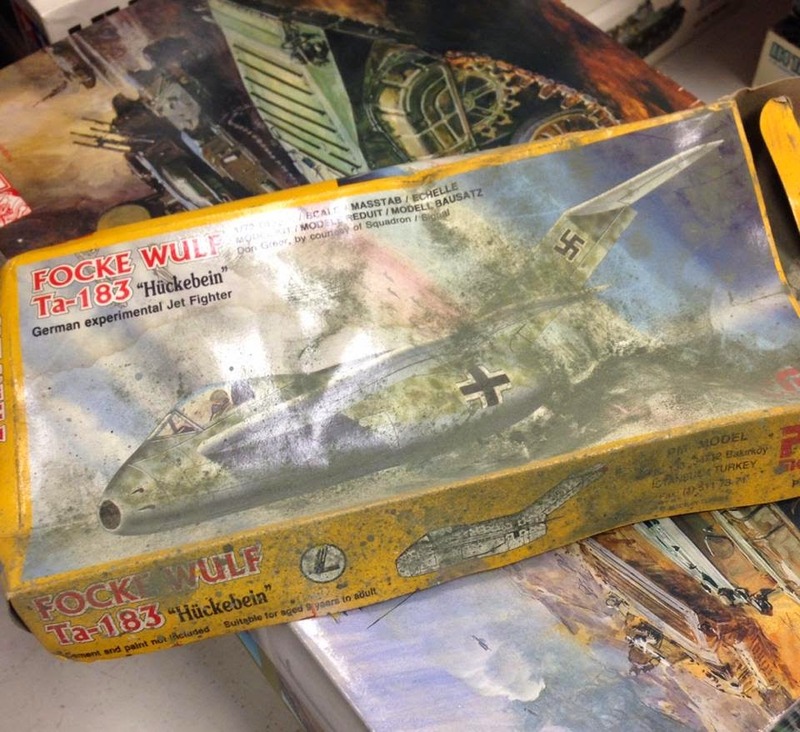 Another favorite of mine among the entries, a Hobbycraft 1/144 RB-36. Yes, those props are actually spinning. Nicely built and weathered Cyber Hobby Firefly Vc. Here's a DML 1/35 Pz. Kpfw. IV Ausf. D with a finish and weathering that, to me, is a bit of a throwback to the 90s, before filters and pigments became all the rage. I think it was one of the best looking models in the armor categories. An Amusing Hobby 1/35 Object 279, which some of you will recall was my most disappointing release of 2013. Mind you, it's a great subject, and this modeler's example was absolutely outstanding. I'm not a car modeler, but it's easy for me to appreciate an example of fine modeling like this Revell 1/25 Dragster. I love the look of classic Bentleys, and this Revell 1/24 1930 4.5L LeMans Racer showed off a great deal of detail in the engine and interior. The sight of a Ferrari stops us in our tracks, am I right?. Here's a gorgeous Hasegawa 1/24 Ferrari 250 Testa Rossa as seen in a 1959 SCCA race. If the paint looks flawed you have to have read the modeler's comments on the entry form: "I didn't go crazy on the finish, because the car was painted with laquer that wasn't rubbed out to perfection." Here's a tiny -- we're talking 1/4828 scale folks -- scratchbuilt World Trade Center. It was made from laser-etched stainless steel with the supporting buildings ABS plastic. From steel to wood with this scratchbuilt 1/48 canoe made from basswood. The ship categories didn't seem to have as many entries as prior years, but there were some very nice builds nonetheless. This Dragon 1/350 USS Benson caught my eye. The most stunning ship entry was this Trumpeter 1/350 HMS Queen Elizabeth. The nastiest thing I saw at the show, this kit on one of the vendors table covered with a thick, green mold. This is NOT something you want to bring into your home!